The heart of a club is its clubhouse. And Brantford’s heart beats strongly, with a vibrant atmosphere and a stunning location overlooking the magnificent Grand River. The clubhouse, which was entirely rebuilt with the latest in modern amenities and opened in 2002, is situated in a remarkably picturesque location standing high above the river valley and from the outdoor patio and dining room one can see numerous holes on the award-winning Stanley Thompson–designed course. Brantford’s clubhouse is where modern convenience meets timeless tradition, making it the perfect location for those important events in life, from weddings to anniversaries. The building is also perfect for corporate events such as banquets and training sessions, with spaces like the stunning Grand River Room, with its mix of elegance and ambiance, able to hold up to 230 people. 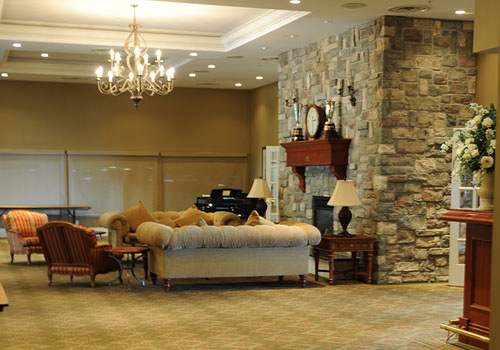 For something slightly more intimate there are plenty of options, including the Grand River Foyer, where smaller groups can sip drinks and chat around the large stone fireplace with its historic clock, part of the first clubhouse that was built at the club in 1920. Smaller rooms can be used for training sessions and business meetings, while the family dining room, a space perfect for that anniversary or important event you want to share with friends, offers the right mix of space and privacy. The club also offers something less formal in the Forbes Lounge, where you can catch a post-round lunch in a casual atmosphere. The most recent addition to Brantford’s stunning clubhouse is the outdoor patio. Facing north towards the 18th hole, where one can take in the breathtaking scene as the sun sets over the Grand River, the patio is the perfect place for a quick drink to recount the achievements of your round, or for a quiet outdoor dinner on a warm summer evening. Simply unforgettable.